Ronaldo Luís Nazário de Lima (Brazilian Portuguese: [ʁoˈnawdu ˈlwis nɐˈzaɾju dʒi ˈɫĩmɐ]; born 18 September 1976), commonly known as Ronaldo, is a Brazilian retired professional footballer who played as a striker. Popularly dubbed O Fenômeno ("The Phenomenon"), he is widely considered one of the greatest football players of all time. In his prime, he was known for his dribbling at speed, feints, and clinical finishing. At his best in the 1990s, Ronaldo starred at club level for Cruzeiro, PSV, Barcelona, and Inter Milan. His moves to Spain and Italy made him only the second player, after Diego Maradona, to break the world transfer record twice, all before his 21st birthday. By 23, he had scored over 200 goals for club and country. After almost three years of inactivity due to serious knee injuries and recuperation, Ronaldo joined Real Madrid in 2002, which was followed by spells at A.C. Milan and Corinthians. Ronaldo won the FIFA World Player of the Year in 1996, 1997 and 2002, the Ballon d'Or in 1997 and 2002, and the UEFA Club Footballer of the Year in 1998. He was La Liga Best Foreign Player in 1997, when he also won the European Golden Boot after scoring 34 goals in La Liga, and he was named Serie A Footballer of the Year in 1998. One of the most marketable sportsmen in the world, the first Nike Mercurial boots–R9–were commissioned for Ronaldo in 1998. He was named in the FIFA 100 list of the greatest living players compiled in 2004 by Pelé, and was inducted into the Brazilian Football Museum Hall of Fame and the Italian Football Hall of Fame. Ronaldo played for Brazil in 98 matches, scoring 62 goals, and is the second-highest goalscorer for his national team, trailing only Pelé. At age 17, Ronaldo was the youngest member of the Brazilian squad that won the 1994 FIFA World Cup. At the 1998 FIFA World Cup, he received the Golden Ball for player of the tournament, helping Brazil reach the final where he suffered a convulsive fit hours before the defeat to France. He won a second World Cup in 2002 where he starred in a front three with Ronaldinho and Rivaldo. Ronaldo scored twice in the final, and received the Golden Boot as the tournament's top goalscorer. At the 2006 FIFA World Cup, Ronaldo scored his 15th World Cup goal, which was a World Cup record at the time. He also won the Copa América in 1997, where he was player of the tournament, and 1999, where he was top goalscorer. Having suffered further injuries, Ronaldo retired from professional football in 2011. As a multi-functional striker who brought a new dimension to the position, he has been the outstanding influence for a generation of strikers that have followed. 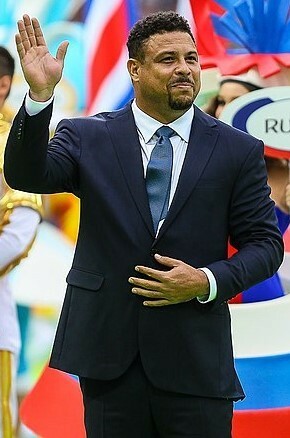 Post-retirement, Ronaldo has continued his work as a United Nations Development Programme Goodwill Ambassador, a position to which he was appointed in 2000. He served as an ambassador for the 2014 FIFA World Cup. Ronaldo became the majority owner of La Liga club Real Valladolid in September 2018 after buying 51% of the club's shares.